Arthur Bernède (1871-1937) was a French author who wrote both prose and poetry as well as libretti for operas. HIs most famous creation was Judex, a popular pulp hero who was immortalised in Louis Feuillade’s 1916 movie serial (Feuillade and Bernède collaborated in the creation of the character). 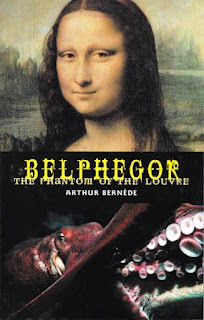 In 1927 he wrote Belphégor: The Phantom of the Louvre, which combines elements of both the mystery and the horror story. Bernède founded a company in 1919 to produce novels and films simultaneously. 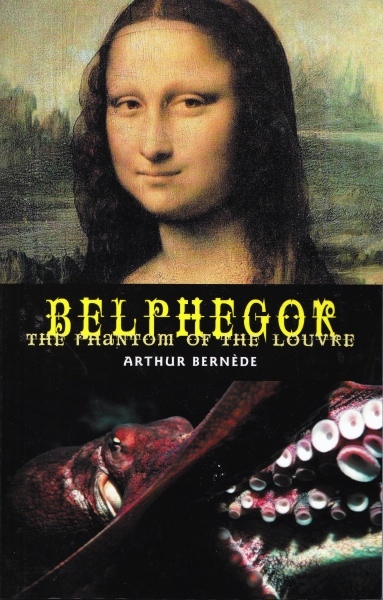 Belphégor was also published as part of a movie-book tie-in (something that Bernède seems to have invented half a century or more before Hollywood cottoned on to the idea). The 1927 movie was directed by Henri Desfontaines. Belphégor is very much in what was by then the well-established tradition of French pulp fiction, a tradition that was established by Allain and Souvestre’s immensely successful 1911 novel Fantômas. The style of Belphégor is very cinematic, with very short chapters corresponding to scenes in a movie. The pacing is relentless and the style is breathless. A daring thief has been at work at the Louvre. He disguises himself with a hood and a mask, leading to the popular supposition that this is no man but a ghost. In fact the reader never doubts that the Phantom is merely a particularly bold and clever criminal. The thief has taken the sobriquet Belphégor, from a malevolent demon of the same name (one of several hints of the gothic in this novel). Inspector Menardier is in charge of the case but he’s not the only one hunting the Phantom. Also on the thief’s trail are a private detective named Chantecoq (popularly known as the King of the Detectives) and a popular journalist named Jacques Bellegarde. Bellegarde has other problems to deal with. Mlle Simone Desroches, a female poet who is the darling of the aesthetes, is madly in love with him. Bellegarde has tired of her attentions and will soon fall in love with Chantecoq’s daughter Colette. These problems are soon overshadowed by a much bigger one - Bellegarde is regarded by the police as the prime suspect in the Louvre robberies. And a guard was killed, so the unfortunate Bellegarde could find himself facing the guillotine. What is the criminal Belphégor seeking in the Louvre? Nothing less than the fabled Valois treasure, rumoured to be concealed somewhere in the Louvre. The exact whereabouts of the treasure are revealed in an old manuscript. Chantecoq is convinced that Bellegarde is innocent but he will need all his skill to prove it and to find the real thief. Luckily Chantecoq, like all good detectives of his era, is a master of disguise. The novel contains everything you could want in a pulp novel and then some. There’s a mystery to be solved, there’s adventure, there’s a diabolical criminal mastermind with a hunchbacked henchman, there’s a master detective, there’s romance and there are secret passages under the Louvre. Bernède combines all these elements with considerable skill and the novel is undeniably exciting and entertaining. There was a new French movie version of this novel made in 2001 but I know nothing more about it. Belphégor: The Phantom of the Louvre is pure pulp fiction fun. 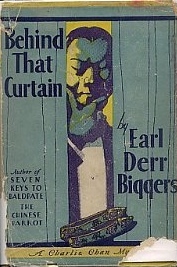 Behind That Curtain, published in 1928, was the third of Earl Derr Biggers’ excellent Charlie Chan mysteries. The great Chinese detective is in San Francisco, on holiday. He is to return to Hawaii in a few days. At the very same time a distinguished retired policeman from Scotland Yard, Sir Frederic Bruce, is also in San Francisco. A bright newspaperman decides it would make a great story if he could bring these two great detectives together. He does so, with momentous consequences. Sir Frederic is still trying to solve two cases that have obsessed him for years, the murder of a solicitor and the disappearance of a young woman from a picnic in Peshawar in India in 1913. He believes he may finally be close to a solution to both mysteries. Both Sir Fredric and Charlie Chan are invited to a dinner in honour of the eminent British explorer Colonel John Beetham. Colonel Beetham is screening moving pictures taken on his expeditions, and while the lights are out Sir Frederic Bruce is murdered. Charlie Chan is anxious to return to Honolulu but he gets drawn into the case. It is clear that Captain of Detectives Flannery has no chance of solving this puzzle on his own. Chan suspects (as Sir Frederic had suspected) that there is a link between the two cases that Sir Frederic had still been working on. But what can the link be? As in all the Charlie Chan novels the highlight of the book is the character of Detective-Sergeant Chan himself. He is one of the most engaging of all fictional detectives. Biggers was clearly very fond of his most famous creation. There is much amusing byplay between Chan and Captain Flannery. There is considerable humour in the book, but it should be emphasised that it is never at the expense of Charlie Chan (indeed much of the humour comes from Charlie’s gentle mocking of the determined but not very bright Captain Flannery). The mystery itself is an ingenious one, typical of the golden age of detective fiction. Biggers was a stylish writer and this is an exceptionally entertaining crime novel and is highly recommended. The Final Count, published in 1926, was the fourth of the ten Bulldog Drummond novels written by H. C. McNeile under the name Sapper during the 1920s and 1930s (although McNeile’s friend Gerard Fairlie would write seven more Bulldog Drummond books after McNeile’s death). The Final Count also marks the fourth occasion on which Drummond would match wits with the sinister criminal mastermind Carl Peterson. The novel is narrated by a man named Stockton, whose friend Robin Gaunt is working on some hush-hush project for the British War Office. Gaunt had been working on a secret super-weapon during the Great War and now he believes he has perfected it. He believes it to be a weapon so terrible that it will make any future war impossible - any nation that possesses the secret of this weapon could impose peace on the entire world and no nation would dare to oppose them. This is of course a slightly eccentric plan, but Gaunt is no madman. Not yet, anyway. Then Stockton receives a strange telephone call from Gaunt. When he hurries round to Gaunt’s flat he is greeted by a strange scene - there is much blood on the floor, there are the dead bodies of a dog and a guinea pig, and no sign of Robin Gaunt. And in the flat next door a man lies dead. When strange and sinister events are afoot, events that leave the police baffled, it is never very long before Captain Hugh Drummond manages to get involved. He has an infallible nose for a mystery and for an adventure, and sure enough he is soon in the thick of things. And this is a very great mystery indeed, and even stranger events will soon unfold. Clearly someone had discovered the existence of Gaunt’s super-weapon and that someone must now be assumed to be in possession of the secret, but what possible connection can this have with the disappearance of a private luxury yacht, the building of a new commercial dirigible and Cornish tin mines? Drummond doesn’t know yet, but he intends to find out. His determination is strengthened when he begins to suspect that his old foe Carl Peterson may be involved. Carl Peterson is Drummond’s Professor Moriarty, an arch-criminal so clever and so vicious that if the public knew of his existence no-one would ever sleep soundly in their beds. This follows Sapper’s standard formula which by this time he had down to a fine art. There will be high adventure and Drummond will have to make use of both his uncanny instincts when it comes to unusual and spectacular crimes, his wartime experiences that made him such a great leader of men, and his pugnacious and indomitable spirit. And of course his fists. The Bulldog Drummond novels might not be great literature but they are great fun. Like Sax Rohmer, McNeile had a gift for story-telling and for coming up with outrageous master plans by which his chief villain could not only pull off audacious crimes, but crimes on such a scale that the very existence of European civilisation would be threatened. Whether you actually like Drummond as a character depends on your tastes. Some modern readers may consider him too patriotic and too faultlessly courageous, qualities that are now out of fashion. But Drummond is a fascinating character as well. He gives the impression of being almost a buffoon but beneath the brash exterior there is a razor sharp mind. This is an old-fashioned ripping yarn, and thoroughly enjoyable it is too. 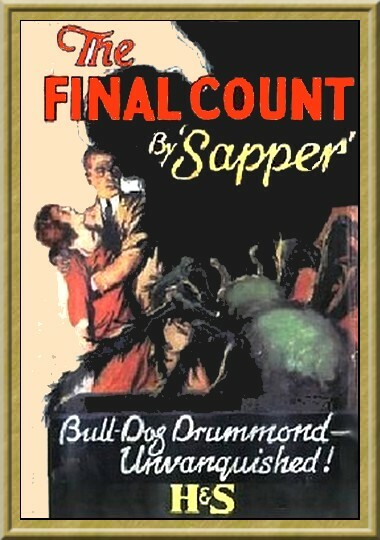 The Bulldog Drummond novels do need to be read in sequence though, so read the first three before reading this one. Drummond’s four encounters with Carl Peterson have been collected in a splendid and ridiculously cheap omnibus edition by Wordsworth, a volume I highly recommend to all lovers of spy/adventure stories featuring diabolical criminal masterminds. 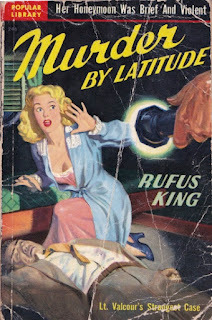 Rufus King (1893-1966) is a now forgotten American mystery writer. Murder by Latitude, published in 1930, was one of the novels featuring his best-known detective, Lieutenant Valcour. The SS Eastern Bay is a freighter recently converted to carry a small number of passengers. For most of the passengers this is strictly a pleasure cruise, but for two of them it means deadly serious business. One is a murderer, the other is Lieutenant Valcour of the New York Police whose job it is to find that killer. It should be a fairly easy job for Lieutenant Valcour - all he has to do is to wait until the New York Police send him a radio message containing an eyewitness description of the murderer. When the ship’s radio operator is found dead in circumstances suggesting foul play his task becomes somewhat more difficult. The Eastern Bay is a small ship and carries only one radio operator. No-one else on board the ship can operate the radio. So now Lieutenant Valcour is on his own and he must find the killer before he strikes again. Without a description his task seems hopeless, but there is a reason the killer has taken the cruise. If he can uncover that reason he should be able to unmask the slayer. To add a further complication, he realises he’s not even certain the killer is male. All he does know is that it’s a passenger, not a member of the crew. That still leaves plenty of suspects. There’s the wealthy Mrs Poole, accompanied by husband number five. There’s Mr Wright, who looks harmless but then murderers can look harmless. There’s young Mr Force. There’s the gleefully cynical M. Dumarque, who glories in his own (largely imaginary) wickedness. But that could be a clever blind. And there’s Mr and Mrs Sanford. It could be any one of them. And of course it could be a stowaway. Valcour can rely on some help from the captain of the ship, an old sea dog named Sohme who proves to be surprisingly sentimental. This is a classic set-up for a murder mystery - isolate a group of suspects so that the reader knows the murderer must be one of a limited number of suspects, and none of the suspects can escape. Nor can their potential victims. King handles this setup with considerable skill and also makes good use of the shipboard setting. At times the sea itself seems as sinister as murder. Not that the ship encounters any storms. Just fog, drizzle and overcast weather. Especially fog. The captain is reduced to navigating by dead reckoning. The fog, added to the loss of their only radio operator, also makes it impossible for anyone to contact the ship or for them to contact anyone else (rather like the classic mystery device of isolating a group of people in a country house in a storm and having the telephone wires go down). The fog is a more subtly sinister way to achieve the same end, and the fact that the captain cannot even say with absolute certainty where the ship is adds to the tension. Being a golden age detective story you expect a plot that is ingenious even if it stretches the limits of credibility. The secret is to stretch the limits of credibility without becoming totally implausible and King succeeds here as well. Valcour is not a colourful detective but he has his human touches - he is genuinely spooked by the fact that they don’t know where they are and he is totally cut off from the normal resources that would be available to a cop. Not only is the ship beset by fog - he feels himself surrounded by a kind of mental fog. Captain Sohme proves to be an engaging and interesting supporting character. Murder by Latitude is a fine example of the crime fiction of the 1930s and it’s also one of the best examples of the shipboard mystery novel. Highly recommended. 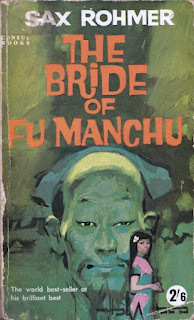 The Bride of Fu Manchu was the sixth of Sax Rohmer’s Fu Manchu novels, and was published in 1933. It’s also in my opinion one of the best. A mysterious epidemic is sweeping through southern France. Dr Petrie, who has something of a reputation for his knowledge of tropical medicine and exotic diseases, has been asked by the French government to lend assistance. What he finds is very disturbing indeed. The disease seems to be a form of plague, but with some unusual features. Equally disturbing is the presence of insects that appear to be hybrids never seen before, and he suspects they may be the carriers. The young botanist Alan Sterling, an old friend of Petrie’s, is in southern France recuperating from a bout of blackwater fever picked up in the Amazon Basin. Sterling (who is the narrator of the book) earns his living as an orchid hunter, an occupation that takes him to many strange places and exposes him to many deadly risks. Danger has been his constant companion and his courage will serve him well in the adventure to come. Sterling has noticed things as well - plants that just don’t look right. Sterling has already had an unusual encounter of a different kind, with a beautiful and exotic young woman named Fleurette on the beach at Ste Claire de la Roche. She appears to be the mistress of the mysterious and wealthy Mahdi Bey, but Sterling finds it difficult to believe that such a vision of loveliness, and such a charming young woman, could live her life in such a sordid manner. Fleurette will later have a major and very unexpected role to play in this story. The thought that Dr Fu Manchu may be the guiding hand behind the strange epidemic has certainly crossed Dr Petrie’s mind. Dr Petrie believes he is on the verge of finding a cure when he is suddenly struck down by this plague-like illness. Sterling will soon have confirmation of Fu Manchu’s involvement when Dr Petrie’s old friend (and Fu Manchu’s great nemesis) Sir Denis Nayland Smith arrives on the scene, but has Sir Denis arrived too late to save Petrie? And why does Nayland Smith seem to know something about Fleurette, something that disturbs him? Sterling will be drawn into the battle to defeat yet another vast conspiracy of the Si-Fan, and will find himself facing not only Dr Fu Manchu, but also Fu Manchu’s daughter Fah Lo Suee (a woman who is as formidable and terrifying in her own way as Fu Manchu himself). But what exactly is Fah Lo Suee’s agenda? 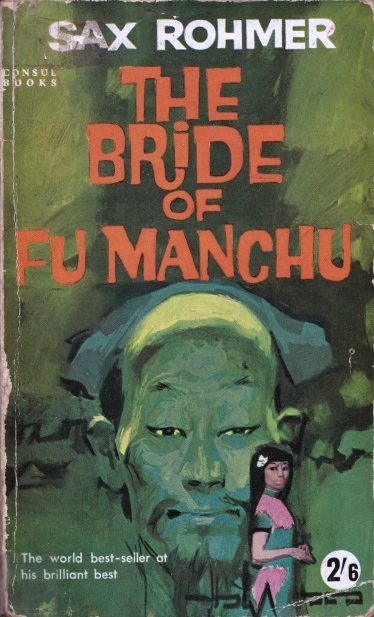 If you enjoy tales of sinister diabolical criminal masterminds (and surely every right-thinking person does enjoy such stories) then The Bride of Fu Manchu delivers the goods. Dr Fu Manchu is one of the great fictional villains, as evil and dangerous as Sherlock Holmes’ great nemesis Professor Moriarty but much more colourful. Fu Manchu is a complex character, an implacable enemy but a man with a strong sense of honour. If Fu Manchu gives you his word about something then he will keep it, and will honour not just the letter of his promise but its spirit as well. He is a villain, but he is also a gentleman. Fu Manchu is no mere cut-throat. He is a man who believes in things. The things in which he believes might make him a dangerous menace to western civilisation but it can never be doubted that his beliefs are sincere. He is, in his fashion, a great man. This is a thrilling adventure yarn. I have no hesitation in warmly recommending it. 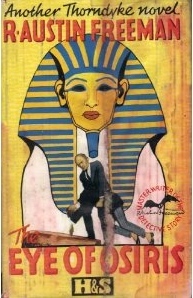 The Eye of Osiris, published in 1911, was the second of R. Austin Freeman’s many Dr Thorndyke mystery novels. And a very good mystery it is too. R. Austin Freeman (1862-1943) is unfortunately little know today except to devotees of vintage crime but this English writer was one of the masters of the detective story and Dr Thorndyke was his greatest creation. Freeman was a qualified doctor and he made considerable and effective use of his medical knowledge in his fiction. Thorndyke is the scientific detective par excellence, a lecturer in medical jurisprudence. He is interested in facts which he organises with an almost brutal meticulousness. He has little time for speculation and no time at all for leaps of intuition. He is not even concerned overmuch with motives. Give him the acts and he will find the one person who could have committed the crime, whose guilt would be consistent with those facts. The Eye of Osiris is concerned with the mysterious disappearance of Mr John Bellingham. A man of regular habits does not call at his cousin’s house, find him not at home, tell the maid that he will await his return, and then simply vanish. But that is what Mr John Bellingham appears to have done. Dr Thorndyke initially has no involvement in this case. He reads about it in the newspaper and notes it as being an excellent example of a point he has just been making to his students - the crucial importance in such a case of establishing the last time (and the last place) at which the presumed victim can be said with absolute certainty to have been still alive. He discusses it with his young assistant Dr Jervis and with a former student, Dr Paul Berkeley (who happens to be the novel’s narrator). Two years later the mystery is still involved and Dr Berkeley finds himself having a chance (but momentous for all concerned) encounter with the Bellingham family. He is called in to treat the vanished man’s brother, Godfrey Bellingham, who is now living in poverty. And he discovers there is much more to this case that was apparent two years earlier. John Bellingham made a fiendishly difficult will, a will that could restore Godfrey’s fortunes, or leave him condemned to perpetual penury. An acrimonious legal case is now imminent. Dr Berkeley also happens to fall in love with Godfrey’s daughter Ruth. Godfrey is a proud man, unwilling to accept help that he cannot pay for, but Dr Berkeley eventually persuades him that if his old mentor Dr Thorndyke were to accept the case it would not be charity since the case is so complex and so likely to produce interesting legal precedents that he would actually be doing Dr Thorndyke a favour by allowing him to become involved. Which is at least partly true - Thorndyke really is eager to get to grips with what should prove a most challenging case. The challenge is firstly to establish if John Bellingham really has been murdered, secondly to find out who murdered him, and thirdly to find a way of fulfilling an apparently impossible clause in the will. Oddly enough almost everybody involved in this affair shares a passion for Egyptology, a factor that will assume considerable importance. Dr Thorndyke himself is by no means a colourful personage- the fascination of the character lies in his methods rather than his personality. Freeman manages to combine a classic puzzle mystery novel (the Thorndyke novels can in some ways be seen as launching the golden age of detective fiction) with a love story. His style is not flashy but nor is it dull. The great strength of the novel lies in the plotting which is ingenious enough and complicated enough to satisfy any fan of the puzzle-style of mystery story.